"MC for me means My Cousin" says Wire MC when asked about his name. His real name is Will Jarrett. 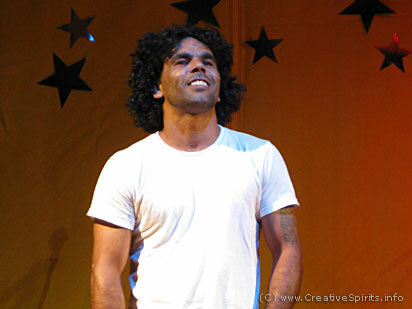 Wire MC on stage singing during the launch of the CD Songbird Calling in Redfern. The CD features songs by local community artists. Wire MC lives in Sydney. Wire MC started a hip-hop crew in Bowraville called Barrung Buljurr Girrawa which means Bowra Rhythm Mob. He also makes music with his two sons. They call themselves the Bowra Boy Clan. There are no other albums of Wire MC because he's mainly playing at festivals and giving hip-hop workshops in Aboriginal communities.